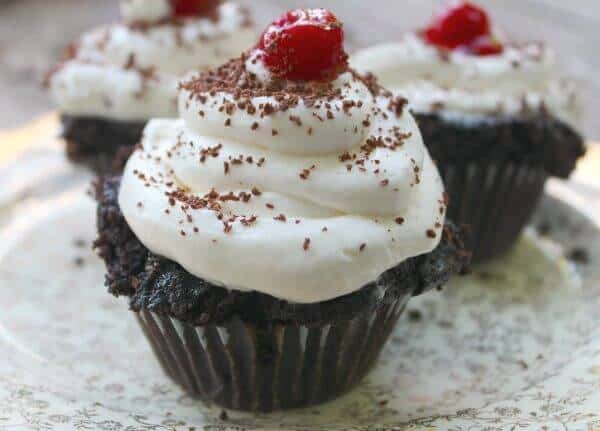 No matter what kind of cupcake you’re in the mood for whether it’s fudgy chocolate, some unique flavor, or something with fresh fruit, I’ve got you covered with this list of the best 50 cupcake recipes ever. Updated from the 2007, 2010, and 2015 versions! What’s the Best Cupcake Flavor? Cupcakes have come a long way in the past few years. From chocolate and vanilla recipes have evolved into creative, unique bites of cake in a range of flavors. You can get them filled or unfilled, decorated to look like mermaids, or topped with mile high frosting. No matter how many cupcake recipes we have we eagerly hunt for more. Here are over 50 of my favorites for you try, from chocolate to vanilla and everything in between. In fact, I’ve added to this page over the years and there are now way more than 50 recipes for cupcakes of all kinds. If you are in a hurry click here to go straight to the recipes list. Be sure to scroll back and read though, or you’ll miss all the great tips! I am always looking for the best cupcake I can find. The most creative cupcake I can find. Cupcakes with unique flavors. I search on the Internet, in cookbooks, and magazines. These little bites of sweet cake and creamy frosting are addictive! Still, as soon as I find something I love I am off to look for more. There’s just something about them. Maybe it’s because they are cute? Maybe because they are single serving? Maybe because you can make them a lot of different ways? Over three years ago I wrote a blog post that made it to the first page of Digg in less than 24 hours. It was phenomenal and continues to be my post with the most traffic to this day… The name? 50 Best Cookie Recipes on the Internet.I have been thinking of this post for a long time. The best cupcake recipes the Internet has to offer at your fingertips. These are the ones that made the best cupcake list for me. The most unique, the most delicious, and the most wonderful I could find. If you like this post consider submitting it to Stumble or Digg as well as sharing on social media. Thanks. School is starting in many areas. To me cupcakes are the perfect treat to pack in school lunches. Cupcakes are small and yet very popular with the back to school crowd. They show up at almost every classroom party or event. It’s just sort of the cupcake time of year. Look at the amazing variety of flavors and textures represented here! Cupcakes are quick and easy plus they are easy to transport if you have a cupcake carrier. Experiment by changing the frosting flavors to come up with your own unique variations. Use different fillings. Add nuts or chocolate chips. Most of all….have a good time with them! All ingredients should be at room temperature. This ensures that they will mix smoothly and easily so your cupcake batter is just right. Use large eggs. Most recipes are made with these and smaller eggs may leave your cupcakes dry. Don’t over mix. When you over mix your batter it develops the gluten — which is great for bread but not for cake! Gluten will make your cake tough and dry. Plus, when you over-mix you break air bubbles. Air bubbles are what keep baked products light. Don’t break the air bubbles! Use a scoop so each cupcake is exactly the same size. That way they will bake all the way through all at the same time. Fill pans 2/3 of the way full. This will make them rounded when baked. Make sure your oven heats to the right temperature. Some ovens become a couple of degrees off one way or another over time. It’s a good idea to have an oven thermometer and check temperatures often. Bake immediately. As they sit the baking powder to lose effectiveness and the air bubbles to deflate. You know that that means, right? Yep. Cupcakes that don’t rise and are tough. Put pans in the center of the oven and don’t open the door until it’s almost time for them to be done. This ensures that they will bake evenly. 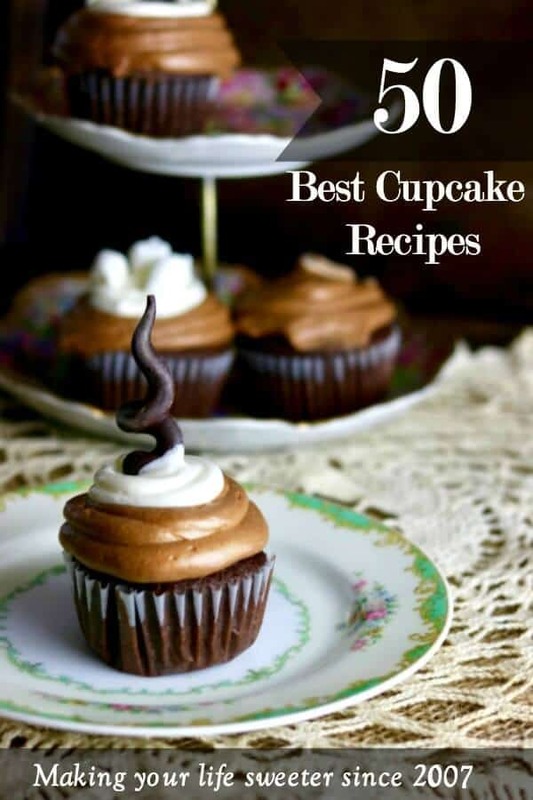 Experiment then make a list of the best cupcake recipes in your opinion. Use these as the foundation of your own variations. Ready? Deep breath…. here we go. Is there anyone that doesn’t like a chocolate cupcake? You’ll find that the cupcake recipes that include cocoa taste more chocolatey than those that use melted chocolate. If you want a dark, fudgy cupcake go with cocoa. Spice cupcakes remind me of fall! Apples, cinnamon, and pumpkin are warm cozy flavors that make great cupcakes! Cream cheese frosting is great on just about any spice cake – for an easy garnish dust with some cinnamon after frosting. Fruit gives cupcakes moisture as well as flavor. Follow the instructions carefully or you could end up with a too-wet dough that won’t bake properly. If you’re using pie filling in the center gently press the bottom down on the inside after hollowing it out but before filling it so that it’s compressed. It helps the bottoms not get soggy. There was a time when there was only red velvet cupcakes but these days you can find that velvety texture in almost any color imaginable. Most of the time the recipe will call for buttermilk. If you use a paste food color instead of a liquid you’ll get a deeper flavor without that weird chemical food color taste. Cupcakes are perfect for taking to holiday parties or sending to classroom parties at school. Decorating them can be as easy as adding holiday-themed sprinkles. If you can imagine it someone has probably made it into a cupcake. Use these unique flavors to come up with your own ideas! Coconut gets it’s own section because, well, coconut. Toasting coconut in the oven or microwave is easy and it adds extra flavor and texture. Ever heard the term plain vanilla? Well these cupcakes are anything but plain! If you really like vanilla flavor you can substitute and equal amount of vanilla sugar for the sugar called for in any recipe. To make vanilla sugar just add a couple of vanilla beans to the sugar canister and let sit for a few days. It’s an amazing list of cupcake recipes, isn’t it? Which are you going to try first? Baking cups are one way to make your cupcakes prettier and more unique. These cute polka dot cupcake liners give cupcakes a retro look I think. Remember I said that to make the best cupcakes it’s important to keep the size consistent by making sure each cupcake is made from the exact same amount of batter? Well these scoops from Wilton make it easier than ever. What is the cupcake at the top of the page that is on the pink and white dish. I would love to try that recipes! 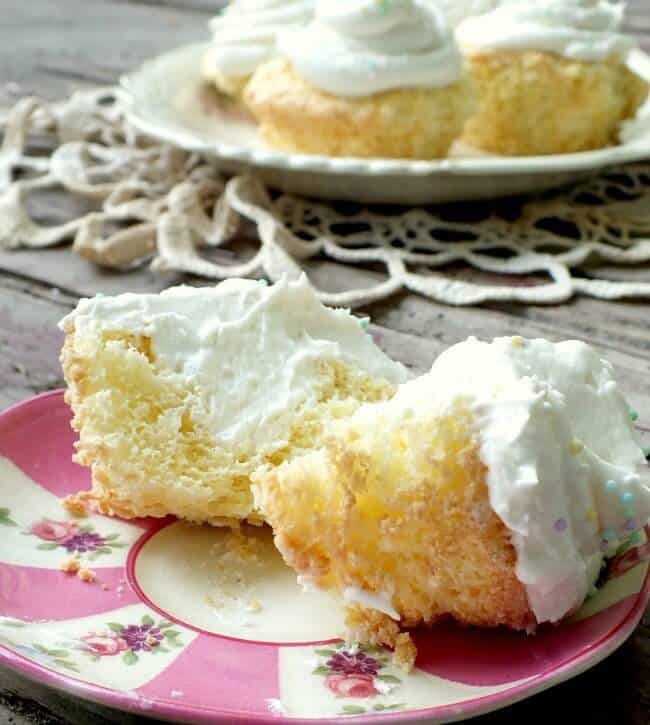 🙂 that’s #48… Copycat Twinkies Cupcakes. I just made the Earl grey cupcakes with lemon frosting. Delicious! Though I did add extra lemon juice since the frosting was a bit sweet to my taste. Did make it become a little runny but I think it’s a fair trade-off. Your tips were a lifesaver. I made strawberry ones before this and had no idea why the cake came out so tough. I wanted to be sure it was all incorporated so I over mixed it. Following your tips, earl grey came out perfect! What a great list! I don’t make cupcakes enough, so will have to work on that with these, but where to start?? I love cupcakes so I think I’ll make every single one of them. Ha. This is an impressive list of deliciousness. LOL! I am attempting to do the same. I love cupcakes Marye. What an awesome collection!! !